"Aplerbeck Haus Rodenberg" by Itti - selbst fotografiert von Itti. "Cologne Germany Flora-Köln-02" by CEphoto, Uwe Aranas - Own work. "DüsseldorfMedienHafen" by MrMello - Own work. "Nordpark Seerosenteich 1" by Alice Wiegand, (Lyzzy) - Own work. 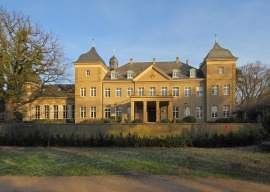 "Schloss Benrath Jan2012" by A.Savin - Own work. 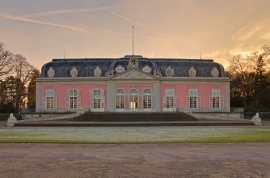 "Schloss-garath" by A.Savin - Own work. 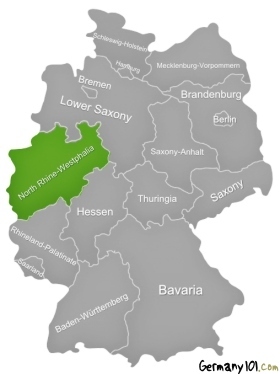 While North Rhine-Westphalia is the biggest region of Germany when it comes to the number of inhabitants (around 18 million), it is only the fourth-biggest region of Germany in regards to the total area. 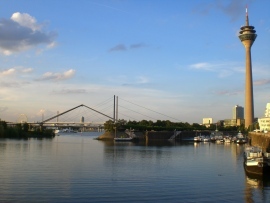 The region is known to have the largest Metropolitan area in Germany (the Rhine-Ruhr), and it is the region in Germany that is most known for its industrial importance. Visitors mainly come to North Rhine-Westphalia to visit Cologne, the biggest city of the federal state, and also one of the most interesting cities for tourists in Germany. While there are outdoor activities in the region, they are usually not the main drawing point for tourists. The Cologne carnival takes place in February. While it's not a warm time of the year, it usually is a very festive season, and people have a lot of fun. 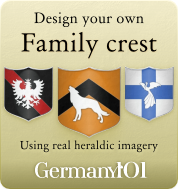 Travel to North Rhine-Westphalia if you like dressing up, and like carnivals. 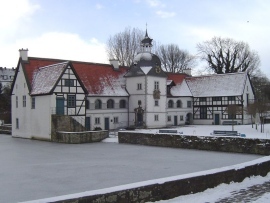 The famous Christmas market, the market of angels, takes place in December. It's not the only Christmas market in Cologne though. If you like Christmas, and enjoy the festive atmosphere, then Cologne is one of the best places to visit during December. The Cologne Gay Pride (Christopher Street Day) usually takes place in June (late June), or early July. It's a very colorful and interesting event, people of all genders, races, and sexual orientation are welcome. If you have a problem with homosexual, bisexual, or transsexual people, then you might want to avoid Cologne at that time of the year. Cologne is a magnet for tourists as there is just so much to see. One of the main drawing points is the cathedral of Cologne, which is also the first thing you'll notice if you arrive by train. It is an imposing structure, and no tourist's visit to Cologne would be complete without visiting this cathedral. There are also 12 Romanesque churches plus a number of other churches. Visitors are spoiled for choice when it comes to historic buildings and high quality museums. 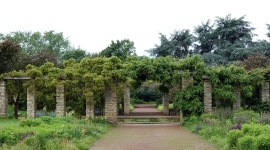 There is also a lovely botanical garden in Cologne. 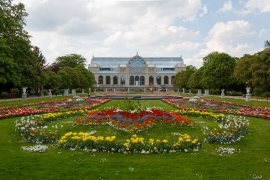 Visit Cologne in spring or summer to see the botanical gardens at their best. The river Rhine is an important feature in this federal state, and if you like being on ships, then most of the cities along the Rhine will have plenty of cruises for you to choose from. You could even take a ship that takes you into other federal states of Germany – or even out of Germany into other countries (the Rhine is a very long river). Bonn has lot some of its attraction value for tourists when it lost its position as Germany's capital to Berlin. Yet, Bonn still has a lot to offer for people who like smaller cities. Some people say that Bonn might very well be part of Italy because of its atmosphere and many street cafes. Bonn is an important place for music lovers as it is the birthplace of Ludwig van Beethoven. Dusseldorf is not only one of the most important financial centers in Germany, it is also famous for its inner city which had been completely destroyed during the second world war. Yet, if you go there, you will not notice this the center has been rebuild according to the original plans. So it is a historic looking city center built with modern tools. Dusseldorf is in general a very interesting city in which modern life coexists next to old buildings. This region is different from the other parts of North Rhine-Westphalia that have a more industrial and work class feel to them. The Rhine and Eifel region is known for its romantic appeal and lovely landscapes. Go there for a few days if you need a break from the cities, and would like to spend a few hours in a forest, or wander along the river Rhine. While transport in the bigger cities like Cologne is not a problem, and there are good links between towns, cities, and villages for commuters, you might find it challenging to get to smaller villages during other times of the day than early morning and late afternoon. There is also limited public transport during the weekends, and many places have none at all on a Sunday. If you plan to leave the usual tourist route and do not have your own transport, then you need to plan your travels very well unless you would like to get stuck somewhere. Not all of the smaller towns and villages have accommodation options for travelers. Cologne has many hotels, hostels and B&Bs, but they can fill up quickly during popular times of the year, e.g. during the annual carnival. Book well in advance if you plan to be in Cologne during that time of the year.